The other day I pulled up in front of the Starbucks where the couriers gather for their mid-afternoon shot of caffeine. There aren't many couriers plying downtown Cleveland, but those who do are likely to ride fixies. I clocked an assortment of vintage US and Italian steel parked by the door. I was on my fixie, too, but the bike earned me some stares. 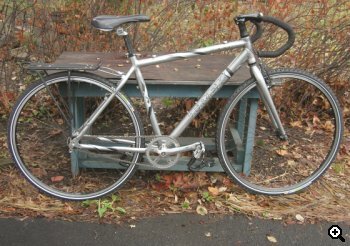 My rig is a converted 2005 Trek 7300fx -- a hybrid. It has turned out to be an eye-catching and durable ride. I bought the bike new, equipped with shifters, derailers and brakes. I had wanted something I could ride 10-15 miles a day for exercise. (I work from home so commuting isn't an option.) Somewhere along the way, though, I discovered 63xc.com and Dennis Bean-Larson's Fixed Gear Gallery. The two sites whipped up my enthusiasm for a new and different way to stay in shape. Repair classes at the local bike co-op gave me the confidence to pull off the bike's components. With a helping hand from an experienced member and an ENO Eccentric hub, I modified the Trek's drive chain and wheelset. I was fixed and loving it. My next task was to stop the bike looking like a hybrid. It didn't take much effort. The manufacturer had given it a sharp silver-and-black paint job, which worked surprisingly well with both alloy and black components. Credit also goes to the bike's geometry and build--although its aluminum frame is angled like a mountain bike, those 700c wheels had already given it a racy appearance. When I added drop bars, a new V-brake and lever, and a 1/8" chain, a bike enthusiast friend wondered out loud where I picked up my 'cross bike. While I had to confess to not racing, his question revealed a truth about this bike. I use it to assault the urban landscape -- or, more accurately, to prevent the landscape from assaulting me. Cleveland streets are notoriously potholed and lacking in bike lanes. It may not be exactly a single-track or fire road experience, but there are times when navigating this city's streets can feel like hauling down Mt. Tamalpais, in traffic. Dave Farkas is a food writer who loves to cycle.